Scripps College community members request use of Scripps campus facilities through the EMS System. 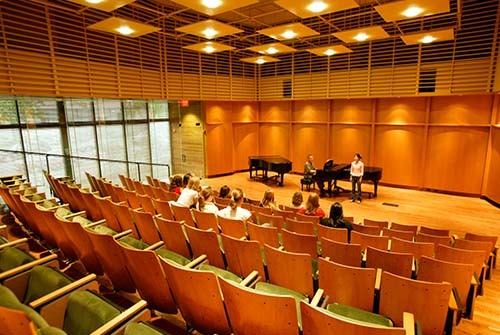 Part of Balch Hall, Balch Auditorium is a central gathering place for events, including music performances, lectures, plays, and community meetings. Boone Recital Hall, part of the Scripps College Performing Arts Center, provides an intimate setting for recitals, concerts, lectures, and academic classes. In 1963, Garrison Theater of the Claremont Colleges opened to provide a facility for all the Colleges to use for theatrical productions, concerts, movies, lectures, and other events.